the members of CEFTA (blue). The Central European Free Trade Agreement (CEFTA) is a trade agreement between non-EU countries, members of which are now mostly located in Southeastern Europe. Founded by representatives of Poland, Hungary and Czechoslovakia, CEFTA expanded to Albania, Bosnia and Herzegovina, Bulgaria, Croatia, Moldova, Montenegro, North Macedonia, Romania, Serbia, Slovenia and the UNMIK (on behalf of Kosovo in accordance with UNSCR 1244). Once a participating country joins the European Union (EU), its CEFTA membership ends. As of 1 July 2013, the parties of the CEFTA agreement are: Albania, Bosnia and Herzegovina, Moldova, Montenegro, North Macedonia, Serbia and the UNMIK on behalf of Kosovo. As of 1 July 2013, the parties of the CEFTA agreement are: Albania, Bosnia and Herzegovina, Moldova, Montenegro, North Macedonia, Serbia and UNMIK (on behalf of Kosovo). Former parties are Bulgaria, Croatia, Czech Republic, Hungary, Poland, Romania, Slovakia and Slovenia. Their CEFTA memberships ended when they became member states of the European Union (EU). History of CEFTA members from 1992 to 2013. 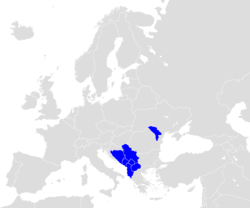 All of the original members of the trade pact became members of the European Union (EU), and because of such, Southeast European nations, such as Albania, Bosnia and Herzegovina, UNMIK (on behalf of Kosovo),[a] Montenegro, and Serbia, joined in and carried the CEFTA. The original CEFTA agreement was signed by the Visegrád Group countries, that is by Poland, Hungary and Czech and Slovak republics (at the time parts of the Czech and Slovak Federative Republic) on 21 December 1992 in Kraków, Poland. It came into force in July 1994. Through CEFTA, participating countries hoped to mobilize efforts to integrate into Western European institutions and through this, to join European political, economic, security and legal systems, thereby consolidating democracy and free-market economics. The agreement was amended by the agreements signed on 11 September 1995 in Brno and on 4 July 2003 in Bled. Slovenia joined CEFTA in 1996, Romania in 1997, Bulgaria in 1999, Croatia in 2003 and North Macedonia in 2006. All of the parties of the original agreement had now joined the EU and thus left CEFTA. Therefore, it was decided to extend CEFTA to cover the rest of the Balkan states, which already had completed a matrix of bilateral free trade agreements in the framework of the Stability Pact for South Eastern Europe. On 6 April 2006, at the South East Europe Prime Ministers Summit in Bucharest, a joint declaration on expansion of CEFTA to Albania, Bosnia and Herzegovina, Moldova, Serbia, Montenegro and UNMIK (on behalf of Kosovo) was adopted. Accession of Ukraine has also been discussed. The new enlarged agreement was initialled on 9 November 2006 in Brussels and was signed on 19 December 2006 at the South East European Prime Ministers Summit in Bucharest. The agreement went into effect on 26 July 2007 for Albania, Kosovo, Moldova, Montenegro and North Macedonia, on 22 August for Croatia, on 24 October for Serbia, and on 22 November 2007 for Bosnia and Herzegovina. The aim of the agreement was to establish a free trade zone in the region by 31 December 2010. After the declaration of independence of Kosovo on 17 February 2008 UNMIK continued to represent Kosovo at all CEFTA meetings. At the end of 2008 Kosovo changed its customs stamps replacing UNMIK with Kosovo. This resulted in a trade blockade from Serbia and Bosnia that do not recognise the Republic of Kosovo. The government in Pristina retaliated by imposing its own blockade on imports from Serbia. This led to clashes at border posts in July 2011. All former participating countries had previously signed association agreements with the EU, so in fact CEFTA has served as a preparation for full European Union membership. Poland, the Czech Republic, Hungary, Slovakia, Slovenia joined the EU on 1 May 2004, with Bulgaria and Romania following suit on 1 January 2007. Croatia joined the EU on 1 July 2013. Montenegro and Serbia have been undergoing EU accession talks since 2012 and 2013, whereas Albania and North Macedonia are official candidate countries of the EU. At the EU's recommendation, the future members prepared for membership by establishing free trade areas. A large proportion of CEFTA foreign trade is with EU countries. ^ ( http://www.imf.org/external/pubs/ft/weo/2017/02/weodata/weorept.aspx?pr.x=43&pr.y=14&sy=2017&ey=2017&scsm=1&ssd=1&sort=country&ds=.&br=1&c=967&s=NGDPD%2CPPPGDP%2CNGDPDPC%2CPPPPC&grp=0&a= ) International Monetary Fund. Retrieved 1 April 2017. ^ "Kosovo Serbs block disputed border crossings". The Australian. 16 September 2011. Retrieved 1 November 2013. 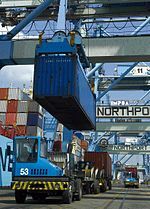 Wikimedia Commons has media related to Central European Free Trade Agreement. This page was last edited on 4 March 2019, at 17:30 (UTC).